Bridesmaids Cast Reunite in Friends With Kids Movie Trailer. Adam Scott, Jennifer Westfeldt, Kristen Wiig, Jon Hamm and Maya Rudolph star in the modern romantic comedy. 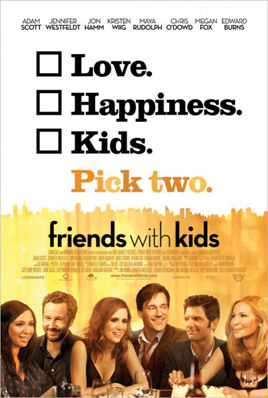 See the movie trailer for ‘Friends With Kids’. Two thirty-something best friends observe the toll that having kids has taken on the couples they know, so they resolve to bypass the stress by having a child and then dating other people. Reuniting several cast members from BRIDESMAIDS, FRIENDS WITH KIDS explores what happens when two lifelong friends attempt to have, and raise, a child in a strictly platonic fashion. A close-knit circle of friends are at that moment in life when children arrive and everything changes. The last two singles in the group observe the effect that kids have had on their friends’ relationships and wonder if there’s a better way. They decide to have a kid together – and date other people.